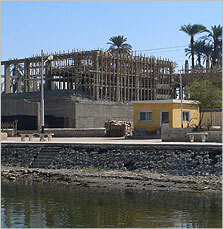 A site museum and visitor centre is currently under construction at Amarna. Its location is a stretch of ground reclaimed from the river, on the east bank beside the landing-place for ferries at Et-Till. It is a project of the Supreme Council of Antiquties, initiated by Dr Zahi Hawass with overall supervision by Dr Khaled el-Hadi, working to designs by Michael Mallinson of Mallinson Architects and Engineers. The museum will combine artefacts from the recent excavations at Amarna with models, photographs, reproductions and information panels. The overall purpose is to acquaint visitors with the character of the site and with the way that modern archaeology can illuminate the past. Education through explanation is the key theme. Since the subject of the museum is life at Amarna. Akhenaten and the royal family appear as they must have done for many of the city’s residents: as influential, but on the whole, background figures.